"The room was clean and the bed was comfortable." 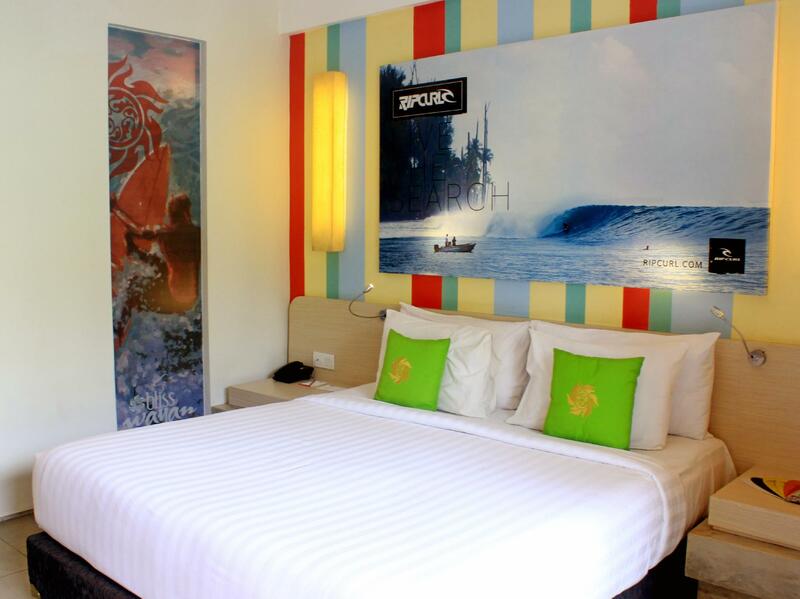 Have a question for Bliss Surfer Bali by Tritama Hospitality? "The staff are absolutely fabulous!" 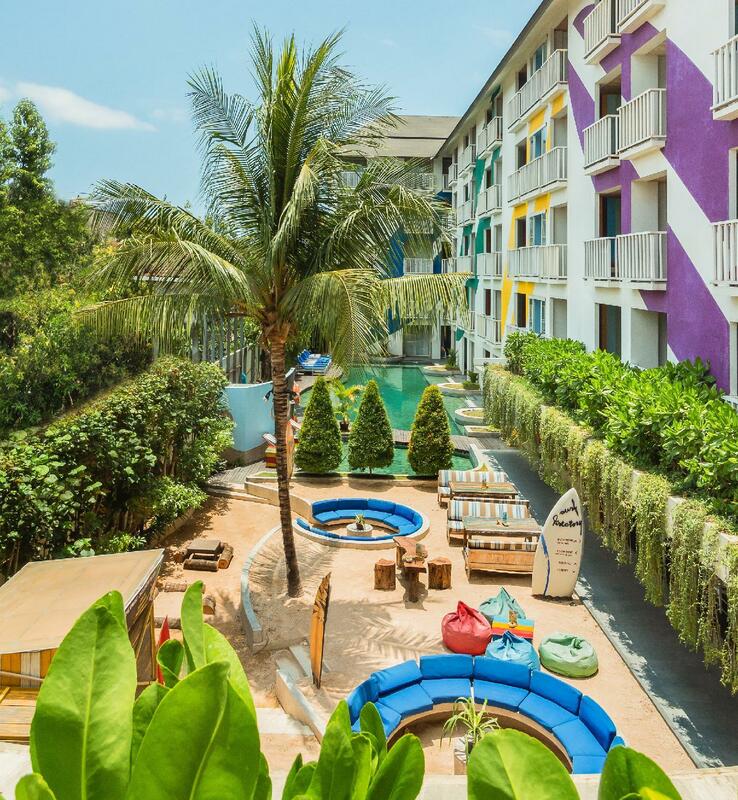 "Very friendly staff, happy atmosphere, very clean throughout..."
Ideally location nearby Legian’s major business area in Jalan Sriwijaya, Bliss Surfer Bali by Tritama Hospitality offers great convenience to business travelers visiting this region. This property offers comfortable guest units facilitated with common daily amenities. A restaurant and bar, a meeting room, and a spa are also available for customer’s use. 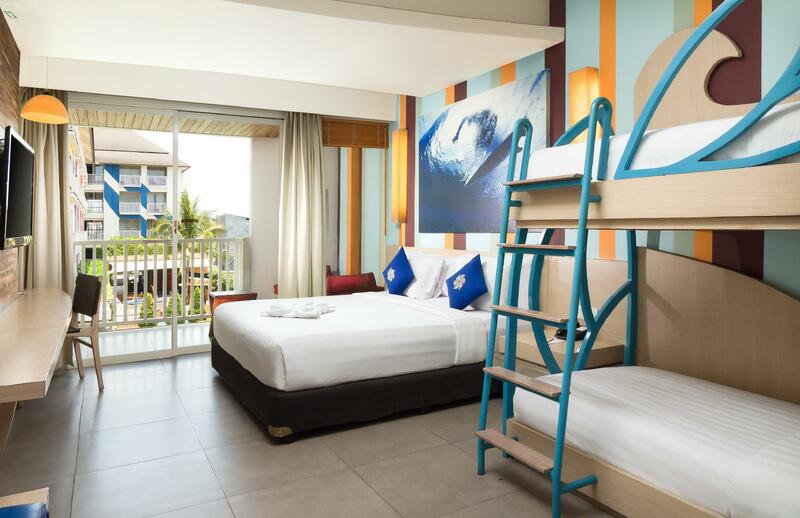 With its Colorful Bliss interior designs, Bliss Surfer Bali by Tritama Hospitality may also be known as a Surfing Hotel Concept. 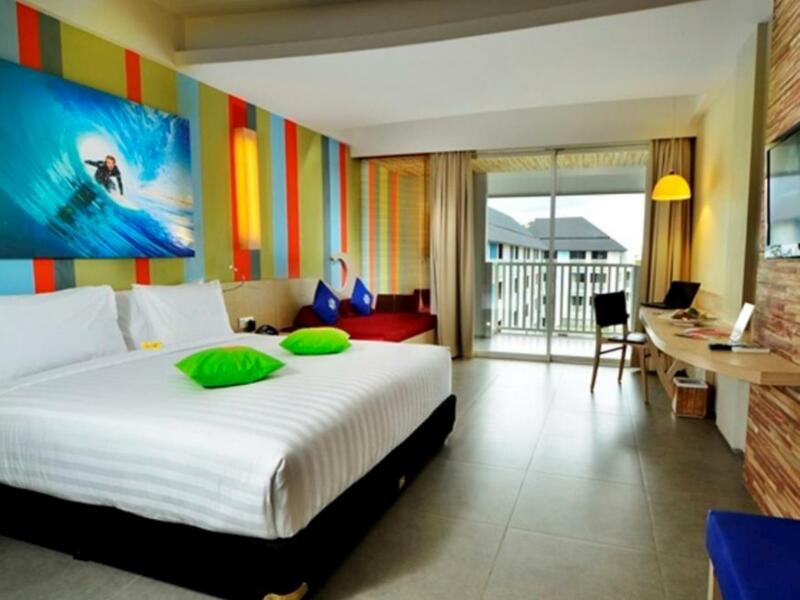 Such exceptional comfort for such decent price can be found in Bliss Surfer Bali by Tritama Hospitality. "Good Service from Staff, Breakfast was decent and quite vary..."
Room was clean. Airport to hotel about 15min Drive. Many driver at outside ariport. Try to get 100rp to 150rp. Check in was fast. All room comes with Balcony and smoking is allowed at balcony. Air-condition was just nice. Not so cold not too hot. Even you have max the temperature. Toiletries were provided too. There mini mart and local food at nearby hotel. About 5 min walk. Bike rental is available at 70rp per day. Just book at reception. Very well maintained property, very clean, good location, staff very helpful, breakfast is great value for money. Staff found me a motorbike to rent at a very good price. Bed is very comfortable. Highly recommend. Much better value for money than two other hotels i stayed in which i paud alot more for. I've said this before and I'll say it again, this is my favorite hotel in Bali. Why? Because it's great value for money, great location, relaxed atmosphere, and has a great staff. I think it's the best overall value for money I have ever encountered and I will continue to stay that this hotel. There is also a great in house massage that is very nice and also very affordable. Give it a try! The breakfast is not elaborate, but it's pretty good. They don't have bacon sitting out, but you can request it and they will cook it and bring it to you as part of the breakfast. The swimming pool is nothing elaborate, but it's adequate. They do have rooms that open directly to the pool on the first floor. I find their rental car service prices are quite comparable with the lower prices in Bali, so if you want to take a car to tour around, their service is a good option. I love my room because it has direct access to the pool. Although I have to inform you that you won't be able to enjoy sunbathing in pool area because it seems the sun doesn't reach that area directly. But for me, no big deal. Location is pretty tricky, i mean it's surely close to beach and shopping area (+/- 15 mins walk) and easy to get taxi or online transportation, but i hate that there is only one way to access it and most of the time it's on traffic (mostly on the afternoon/night). The good thing about this place is big parking area. I don't really like the breakfast. I think it can be improved. I stayed there 2 nights and i think the menu were kinda same. I also don't like that I can easily hear sounds from outside or other room. Anyway, I'd say that I had pretty good experience during my stay here. Still, my most favorite part is the pool access room. Hopefully I'll be back in the future. The room was clean and the bed was comfortable. The flat screen tv had good reception with plenty of movie stations to choose from. Wifi was excellent and the breakfast was great, with a good variety. Staff were pleasant. However ithere was a lot of condensation on the floor in the morning and the view from the bedroom was not very good. Overall it will be a great hotel for travellers on a budget. The hotel brings an excellent services for visitors from the room to the restaurant. The check in and check out process is quick. The room is spacious with pool view. The bathroom is quite dark but clean. The food is very good. 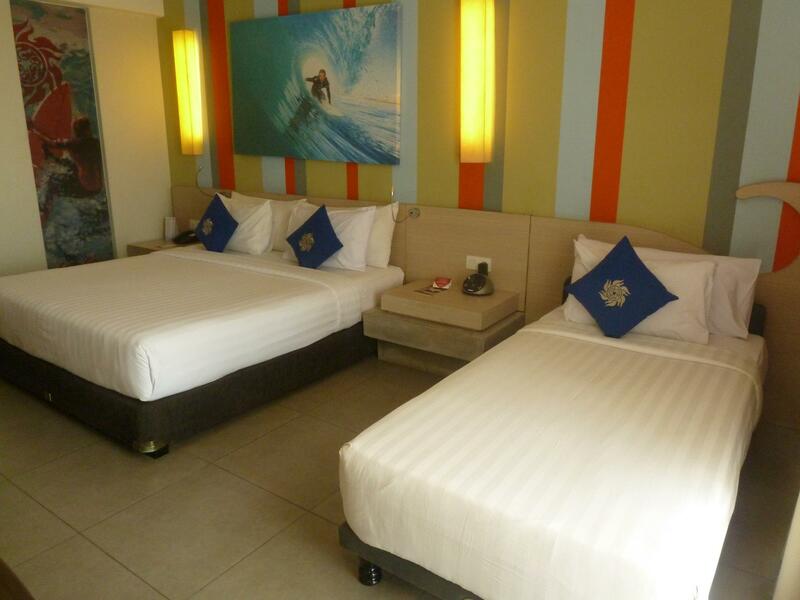 The room was clean and the bed was comfortable.. the staff so friendly, i will come to Bliss Surfer Bali next time.. Highly recommended..
Pros- pool access room was amazing! Food and drinks prices were very reasonable, friendly staff and the massages were great and well priced. Hardly any other people seemed to use the pool and it was nice and warm (which I liked). Highly recommend the floating breakfast. Cons- buffet breakfast was just ok. Shower head could do with replacing as pressure wasn’t great and it was only slightly warmer than Luke warm. Good location as only 10 min walk to Legian. Stop off at Fat Tony's for a burger along the way. I didn't mind the hotel but thought our room was lovely but it wasn't so clean in the bathroom. The breakfast was very good, quite a bit to choose from. The pool is nice and the outdoor area aswell. The only problem with it was the decking surrounding the pool was quite loose in parts so have to be careful not to trip.